The Erawan Shrine where the Four-Faced Buddha is located, is a very famous and popular tourist destination. This post will show you how to get there and how get your prayer offerings the way locals do. 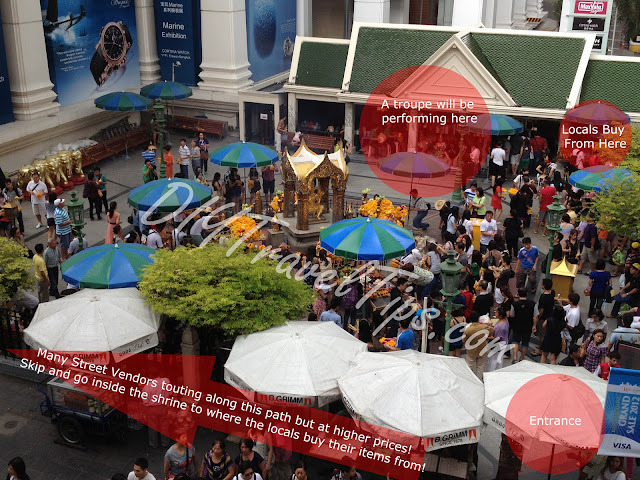 It is actually an open air shrine (no cover) and just beside the Grand Hyatt Erawan Hotel. You can take the BTS to Chitlom station and walk through the connecting walkway to Erawan Hotel. Exit the hotel and turn left, but not before being greeted by a line of flower vendors touting their prayer items to you. They will ask you to buy their flower garlands, four of them for each side of the Buddha for 600 Baht. They will also throw in the joss sticks, candles, gold paper for free. HANG ON THERE! If you are really interested in offering your prayers to the Buddha, why not do it the local way? Skip past the line of vendors outside and walk right into the shrine. From there, head towards the right. There should be a troupe performing. Next to it on the right is a small shop that sells exactly the same stuff that the street vendors are touting to you. Trays with the standard prayer items (garlands, joss sticks, candles and gold paper) will be on display which you can get for 550 Baht. If you know a little Thai, you might be able to get it even cheaper. I cannot be sure but I saw the locals taking out less than 550 Baht for the tray of items. Maybe there is a tourist price and then a local only price? If you are even more adventurous, from the entrance of the shrine, cross the road towards the direction which is on the opposite side of the BTS line. This direction will bring you to the Pratunam wholesale market and Platinum Mall where all the latest ladies fashion can be found. However, along that street you may also find other flower vendors that are willing to sell you the same prayer items at possibly half the price! By the way, you will come across another smaller open air shrine along the way (just outside the Big C Supercenter). Anyway, if you are wondering what the pieces of gold paper are for, it is for sticking on to the railings surrounding the Buddha. I believe it signifies showing your respect and making contribution to the Buddha. And before I forget, here's the usual disclaimer. So far your info on Erawan Shrine has the most useful guidelines for tourist. me & 2 friends have booked our flights to Bangkok on 3rd November for 3 nights stay and our main intention is to visit Erawan Shrine. Any idea to which 3 star hotel is save for 3 women travelers? Thanks for your kind comments and sorry for the late reply. I would say most hotels are in clusters which means there are lots of tourists around the area and should be quite safe. I know Grand Hyatt is just beside the shrine, but thats already out of the 3 star hotel definition. 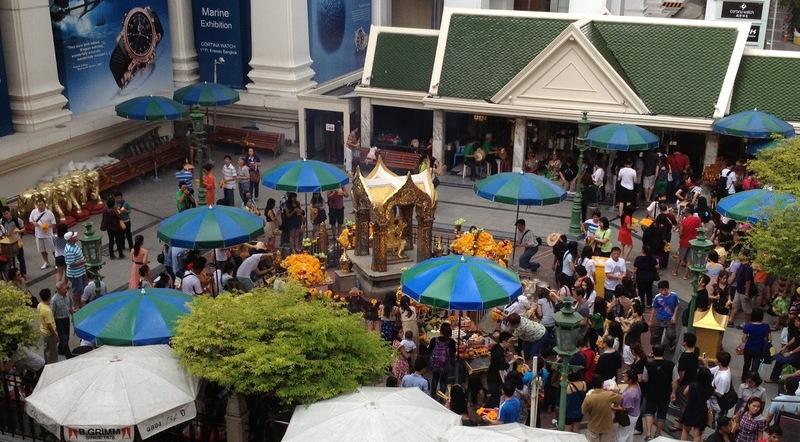 For a three day trip, the Erawan Shrine area might not offer much entertainment. You might want to think about staying near where the action are e.g. Khao San Road (nightlife) or Platinum Mall & Pratunam area (shopping). If you are worried, I would suggest looking for hotels near main streets and train stations so you would not have to walk too far and away from main traffic to reach your hotel. And of course stay together with your friends and keep your bags close to your body at all times.